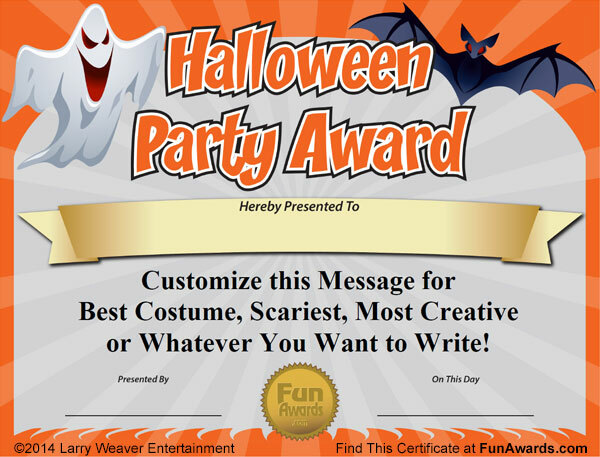 Need a free printable certificate for your Halloween Party? Whether your party is at school, your home, or the office, we've got a free printable certificate that will fit your needs! Typical Halloween Party Award ideas include Best Costume, Scariest Costume, Most Creative Costume, Sexiest Costume, Naughtiest Costume, Best Homemade Costume, Best Couple, and Best Overall Costume. But your Halloween Party awards don't have to be only about costumes. You could give out awards for Tastiest Dish, Best Decorations, Top Jack-o-Lantern, Cutest Couple, or whatever you can imagine. The great thing about this free printable PDF certificate is that you can quickly and easily customize it for your needs. You can type directly onto the certificate template and add your own message before printing. Within seconds you'll have a unique award that will bring smiles and laughs to your Halloween Party! Have your own Halloween Party Award Ideas? Post them in the comments section below.